Manufactured to British Standard 2037-1994 Class 1 for heavy duty industrial use. Heavy duty box section stiles with radiused corners. Serrated rungs fitted through stiles at a standard rise of 250mm. Serrated rubber feet fitted as standard. Extra heavy duty ladders are a must have when you are working at height in an industrial environment. 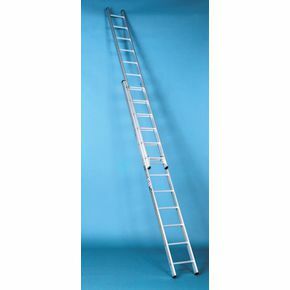 Our two section ladders are manufactured from aluminium to deliver a strong, reliable and safe product. They feature non-slip grip for security and serrated rubber feet to ensure safety and peace of mind for the user which allows them to perform tasks at above-ground level with ease. The large rungs give increased comfort and safety to anyone using the ladders; they are equipped with heavy duty box section stiles for enhanced stability. A push-up structure in two sections gives the ladders easy extension and they are manufactured to British Standard 2037-1994 Class 1 making sure that they are high standard for industrial use. The overall design gives a safe handhold, while ensuring there is a secure grip on floors, walls and other surfaces, providing an extremely safe piece of equipment to use in heavy duty environments. You are sure to find our two section push-up ladders to be of benefit to your work, available in a choice of four extended heights; 5.55m, 6.3m, 7.55m and 8.55m - they come with FREE Delivery and 12 months guarantee.